Liberty Bell’s Dusty Patterson, No. 20, launched a jump shot against Oroville last week as Shay Crandall positioned for a possible rebound. The Liberty Bell High School boys’ basketball team ended its season with a strong showing against one of the league’s better teams, losing to Oroville 54-43 on the Mountain Lions’ home court on Feb. 5. Discounting the second quarter, Liberty Bell played the Hornets evenly. But Oroville outscored the Mountain Lions by 11 points in the second frame, which was the final margin of victory. Senior Simon Studen ended the first quarter with a three-pointer to keep Liberty Bell close at 18-14. But the Liberty Bell offense fell off during the second quarter and the Mountain Lions trailed 34-19 at the half. In the final 16 minutes, Liberty Bell outscored the visitors, 24-20. Sophomore Nolan Falcon-George ended the third quarter with a trey that brought the Mountain Lions within 12, 42-30. 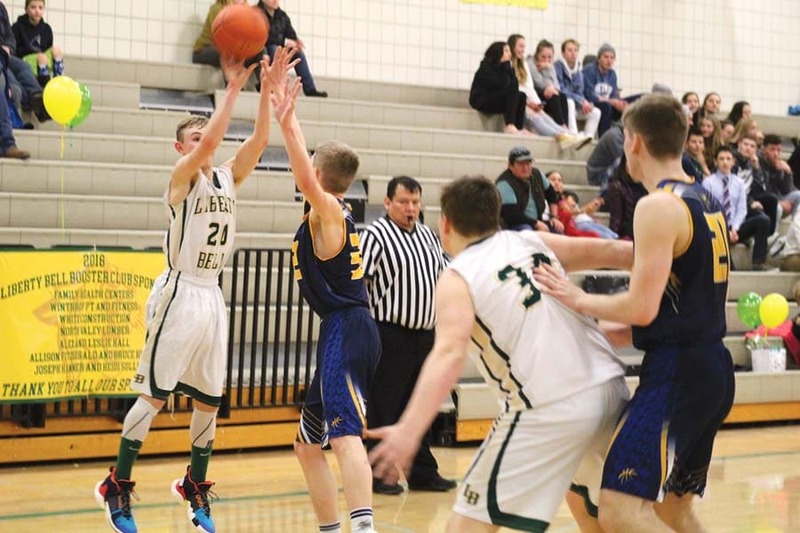 Despite some hot shooting by junior Shay Crandall in his best game of the year, Liberty Bell couldn’t catch the Hornets, who finished tied with Brewster for first place in league play. Studen led Liberty Bell’s scoring with 14 points, followed by Crandall with 13. Falcon-George had nine. For the season, the Mountain Lions’ scoring was led by sophomore Lucaas Gonzalez-Ortega with 177 points, followed by Studen with 129 and sophomore Dusty Patterson with 124. Liberty Bell ended the season with a league record of 3-13 and was 4-16 overall — improvement over the previous two years in which the Mountain Lions did not win any games. Studen and Owen Hevly were honored during Senior Night activities.